← Somebody made a manga based on me! Character of the century, right here. It’s not hard to see why ~*Erased*~ is so popular and highly rated. In all my years of watching anime, I can’t think of any characters as instantly endearing and likable as Kayo. She’s the damsel in distress trope, dressed up in cute little girl form with a touch of tsundere to boot – a weeb’s dream, huh? The voice actress behind Kayo (Aoi Yuuki, known for voicing Madoka) delivers raspy lines that ramp up from shy and quiet whispers to fully confident speech. My favorite anime, Eureka Seven, takes its full 50 episodes to build up Eureka’s character from a stone-cold, emotionless wall to an emotional and outspoken love interest. 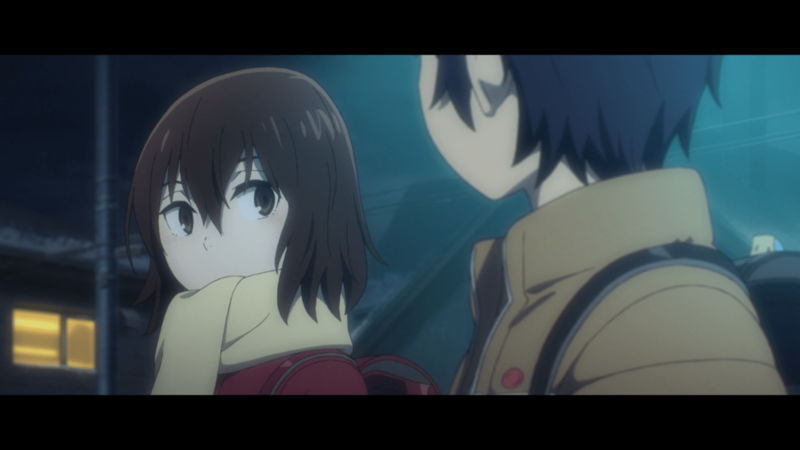 With Erased, the same thing happens but over only 6-7 episodes. It’s Eureka Seven-level character development in its rawest form, and it’s just so satisfying to watch. Unfortunately, after taking out the most interesting character, the last third of the series can’t even get close to the magic of the first arc. I read some people saying it’s just that fans felt like their SatoruxKayo pairing got ruined, and I think that’s essentially right. The overarching mystery plot got thrown away early on in favor of developing Kayo’s character and a romantic drama subplot. This bit got out of control, dominating each episode until Kayo basically gets cut out of the show… cold turkey. My and others’ feverish addiction of Kayo can’t be satiated by simply returning to that husk of a mystery show! I don’t care who the killer is! Give me more Kayo! Time to read the manga. I heard that ends differently. So I read the manga. (It’s pretty short – 45ish chapters.) I can finally see where the anime was trying to go with the mystery and with the Airi ending. I especially liked how Satoru took a long time to get his memories back, instead of the sudden ‘just according to keikaku’ moments from the anime. I also liked the more important role Airi played in the manga – Satoru realizes that by changing the past, he’ll never be able to see Airi again, and that convinces him to go reach out to her… or something like that. But still, I think overall the anime is still way better than the manga. If you take out the Kayo, you’re left with just a mediocre mystery plot.